From left to right, Dr. Angela Everson Ray, Allen Sanders, Cheryl Binegar and Dr. Lisa Gordish participated in the second “Trauma-Informed Care” presentation recently. The Fayette County Board of Developmental Disabilities hosted a second “Trauma-Informed Care: An Introduction” on May 8 at Southern State Community College. As before, this training was provided free by The Central Ohio Trauma-Informed Care Collaborative, which is a collaboration between the Ohio Mental Health & Addiction Services and the Ohio Department of Developmental Disabilities. Dr. Angela Everson Ray and Dr. Lisa Gordish returned for the presentation, along with Allen Sanders from the Franklin County Board of Developmental Disabilities and Fayette County Board of DD’s very own Cheryl Binegar, SSA and certified trauma-informed care trainer. The first TIC training occurred on Jan. 25. The following objectives were met, which included, the definition of trauma-informed care, the ACE study, essential elements of comprehensive trauma assessment, the essential elements of a trauma informed biographical timeline, along with a focus on how to address resiliency. The Fayette Board of Developmental Disabilities has a vision of a trauma informed community that offers empathy and understanding, and promotes healing for a healthy and stronger community. It will be planning future opportunities to build on what has been started. Please contact FCBDD at 740-335-7453 if you have any questions or need more information. 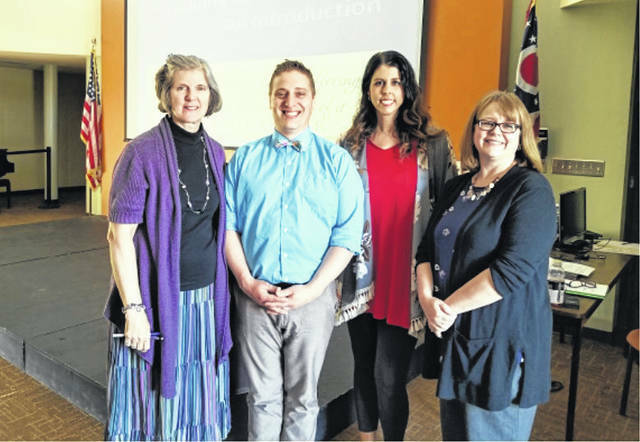 https://www.recordherald.com/wp-content/uploads/sites/27/2018/06/web1_TIC.jpgFrom left to right, Dr. Angela Everson Ray, Allen Sanders, Cheryl Binegar and Dr. Lisa Gordish participated in the second “Trauma-Informed Care” presentation recently.